• The capacities of the Elkon Twin-Shaft Mixers are 1500/1000 l, 3000/2000 l, 4500/3000 l, 6000/4000 l, and 6750/4500 l.
• They are widely used for producing ready mix concrete and heavy density concrete ( For Example It’s used for construction of dams etc. ). 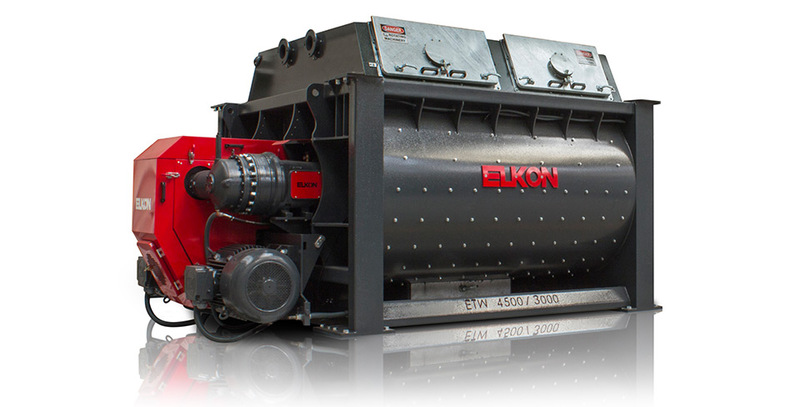 • Elkon Twin-Shaft Mixers can be manufactured with double discharge gates in the capacities of 3000/2000 l . and 4500/3000 l.
• With It’s compact structure and advanced technology, Elkon Twin-Shaft Mixers can work with between 0-150 mm aggregates.•The mixer is consist of two horizontal shafts and coupled engine-gear box group. • To produce concrete with better quality scrapers at the end points which stand at specific angles to each other work simultaneously. • Mixer body welded steel construction.Inner bottom linings and inner lateral linings are cast steel wear resistant Mn alloyed, replaceable. • Mixing arms screwed on shafts. • Lubrication system for mixing shafts’ seals with electrical grease pump (automatic greasing system). • The members of mixing reduction gears and the mixing axles bearings are greased in oil bath in the carter in a lasting way. • Cover with two inspection doors in accordance with the accident prevention and safety regulations (mixer stops while inspection door opening). • The capacities of Elkon Planetary Mixers are 375/250 l., 750/500 l., 1500/1000l. and 3000/2000l. 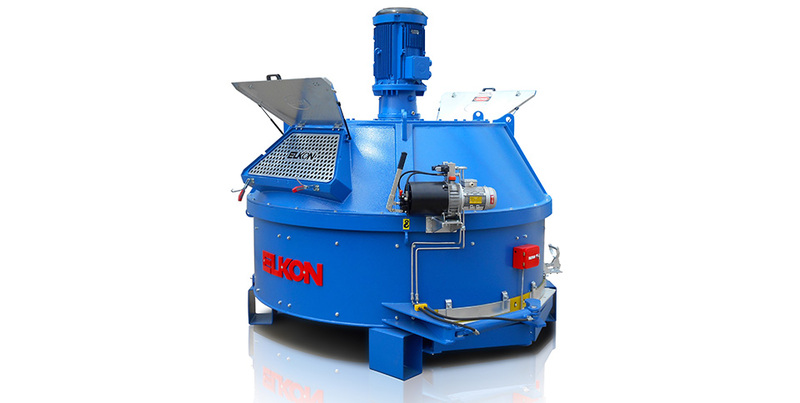 • Elkon Planetary Mixers are widely used especially for producing concrete pipes, paver stone, prefabric elements or special concrete units those require low slump concrete. • Elkon Planetary Mixers can be manufactured with double discharge gates in the capacities of 1500/1000 l . and 3000/2000 l.
• It’s possible to catch the most effective discharging. • Elkon uses star type technology like the earth and the solar system. The mixer arms rotate and at the same time the mixers stars which are connected to mixer arms rotate around their axis too. • The rotation speed of the mixer stars change according to the size of the mixer from 36 to 48 cycle/minute. Elkon Pan Type Mixers are widely used for a long time especially in ready mix concrete business. • The capacities of Elkon Pan Mixers are 375/250 l. , 750/500 l. , 1500/1000 l. and 3000/2000 l.
• Elkon Pan Type Mixers can be manufactured with double discharge gates in the capacities of 1500/1000 l. and 3000/2000 l.
• Mixing paddles of the mixer are equipped with special springs to prevent the mixer being damaged in case of a big sized material comes in to the mixer. • Mixer body is welded steel construction. • Linings (bottom and lateral) of pan mixer are special wear resistant 3990 Mn alloyed ST-52, replaceable linings. • Rotor is equipped with mixing arms which have security mechanism with springs. • Wide mixer cleaning and maintenance gate with dust sealing. • Mixer has maintenance gates and observing gate on it. • There is a security system (for preventing accidents) which stops operation when maintenance gates will be opened.